Occasionally, we come across adversities as we navigate through life. Sometimes these obstacles that life throws at us seem insurmountable. For many of us, the easiest thing to do when faced with hardship is to retreat. Then there are those who are brave in enough to soldier on kicking down all the barriers. One such phenomenal woman is grade 1 special needs teacher at the Sparrow Foundation School, Michelle Pellaton. We live in a society where a lot of women are raised to aspire to marriage and be mothers. For a lot of women, being a mother forms a large part of their self-image. When life happens however, and it does not turn out as we wanted it to, the consequences can be crippling. “When a woman cannot bear children, it tremendously affects her identity, but the pain can extend far beyond her to impact personal relationships,” says Lindsay Getz, a Freelance writer based in the United States of America. When Pellaton found out she could not have children, Instead of succumbing to depression and anger, her passion for children is what got her through. “I asked myself, ‘who are we to complain about our lives when there’s so much we can do for these children?’. There’s no reason why we should be allowing them to grow up thinking that that the world is cruel,” says Pellaton. She further adds, “Honestly, when I was going through Chemotherapy, these are the people that really got me through (Her learners),” Pellaton says. Her passion for dealing with children with special needs was partly inspired by her brother who is dyslexic. “I love autistics, I have so much love in me and I choose to give it to my children,” she says as her face lights up. From as early as 19 years old, she helped run a nursery school for five years in Sandton, Johannesburg. She has been and is still involved with various charity organisations including Nkosi’s Haven. 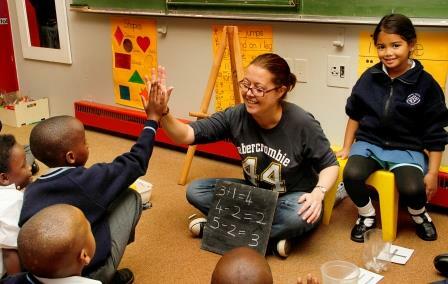 Her classroom consists of children facing various learning barriers including autism, abuse and some are from places of safety. As we all celebrate womanhood and pay tribute to the indomitable spirit of women across the country, Pellaton has some grievances. “For me women’s month means nothing because women still don’t get enough respect. I feel that it should be an ongoing thing, not just in August. There should be more respect and more understanding,” Pellaton explains. 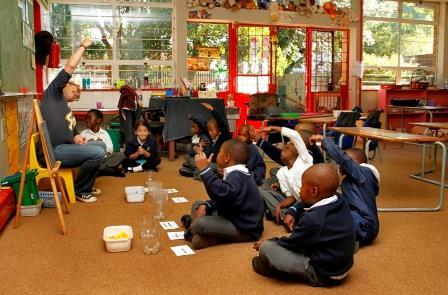 Sparrow Schools Educational Trust takes pride in being able to continually provide effective solutions to resolving South Africa’s education crisis, helping eradicate poverty and unemployment. Although the country still faces serious challenges, great strides have been made to ensure that there is equal opportunity for all. However, South Africa faces another hurdle in its pursuit for equality for all, Gender Discrimination. According to statistics published by the South African Revenue Service, “women earn nearly a third less than men on average in South Africa.” Women are faced with the challenge of having to do twice the work to prove their worthiness. The patriarchal status quo continues to be the hindering factor in many South African women’s lives. However, just as South Africans fought to put an end to an unjust Apartheid system, the fight against gender discrimination is very much alive. Some young women are choosing to break down gender stereotypes and refuse to be victims. Emily Phepheng, is just one of many young women who have had to overcome great hurdles. The young woman from Limpopo fell victim to a tale old as time. Boy meets girl, girl likes boy, boy and girl fall in love, girl falls pregnant and the father avoids responsibility. Phepheng fell pregnant at 20 years and the father left her to fend for herself. “I remember how difficult it was, I was young and I did not know how I was going to handle it,” Phepheng says. 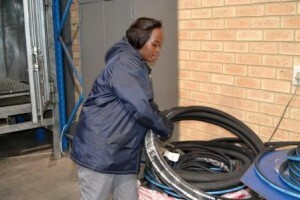 Instead of taking the easy road and wallowing in despair, Phepheng enrolled at the Sparrow FET College for a Fluid Power Hose Assembly Skills Program. 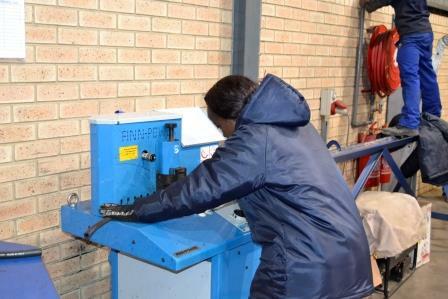 Despite the hydraulics industry being male dominated, Phepheng is on a mission to break down the stereotype. Her persistence and dedication earned her the title as class captain from a class dominated by males. 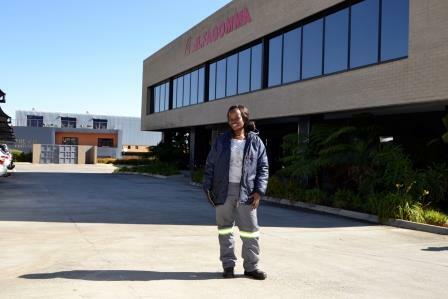 Now 27 years old and a single mother of 2, she is now a permanent employee at hydraulics company, Alfagomma. She remains unfazed and continues to conquer the gender stereotypes. Her motivation comes from wanting to inspire her peers, moving them to take a stand and conquer their fears. 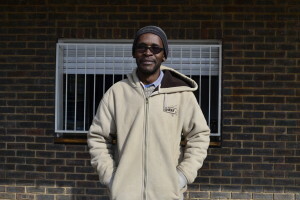 “Do not focus on not having money, I went to Sparrow and got more information and here I am now,” Phepheng stresses. In respect of women’s month, we will continue to profile women whose lives have been changed. We will also be profiling the women playing crucial roles in ensuring that Sparrow Schools Educational trust continues to inspire action and change lives. 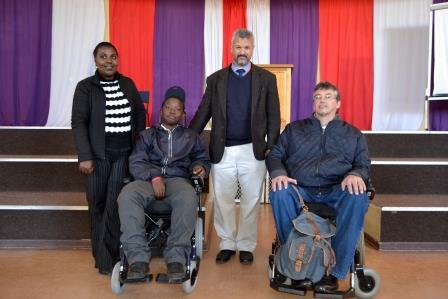 On 28 July 2015, The Muscular Dystophy Research Foundation (MDRF) donated an electric wheelchair to a Sparrow Combined School learner, Philile Shweni. 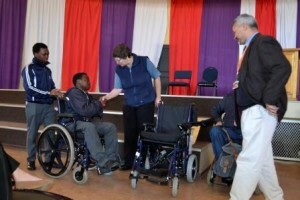 Shweni was diagnosed with Muscular Dystrophy at an early age and has had to depend on a wheelchair to get around. According to Wikipedia, Muscular Dystrophy is a condition that causes one’s muscles gradually to weaken over time. In South Africa, the condition affects 1:1 200 people. The MDRF was represented by General Manager, Pieter Joubert,who is also affected by MD. 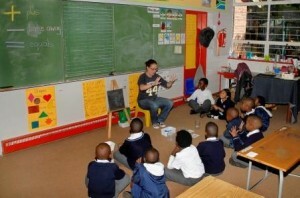 He was accompanied by Occupational Therapist, Erica Gerthsen and Fundraiser, Braam Roux. “There are 1200 people in South Africa affected by this condition. We at MDRF understand what Philile and others are going through and that is why we go out of our way to land a helping hand. We understand that not everyone can afford these wheelchairs as they are very expensive,” Joubert explains. Philile’s sister, Phumla Shweni, was also there to witness the handover and was evidently overwhelmed with joy; you could sense the relief in her voice as she spoke. “I’m so grateful and happy for him, it has been very difficult for us at home because he could not do most things on his own. 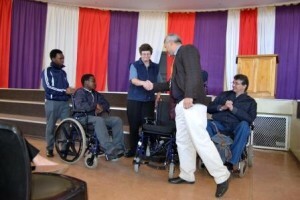 The wheelchair is definitely going to help us and him,” Phumla said. According to WEB MD, there is still no cure for any form of Muscular Distrophy, but medications and therapy can slow the course of the disease. There are currently research projects that are working on a cure for the disease. The Department of Health has dedicated the month of September to raising awareness around the disease. Wear a lime green ribbon to show your support. Every July 18, the world comes together to celebrate the late icon, Nelson Mandela’s birthday by committing 67 Minutes to doing good deeds. 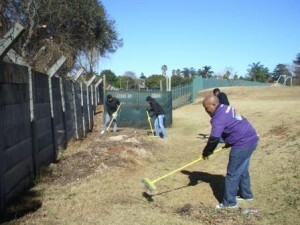 Our Foundation School in Melville and our High Schools in Sophiatown welcomed the support of Hollard Insurance, Transnet National Ports Authority (TNPA) and Virgin Active Milpark for their 67 Minutes Mandela Day helps. The Day kicked off at the Foundation School with an opening statement by the TNPA, organising committee member, Sizwe Msila. “Today will evoke a sense of consciousness in all of us,” Msila said before handing the floor to TNPA’s Acting CEO Nico Walters. “As a corporate, part of our role is to give back to the community. It is truly a privilege for Transnet to be a part of something like this. We would like to thank the school for giving us this opportunity. Let us do our work today, in Madiba’s spirit,” Walters said. The Foundation School Principal, Vanessa Brodrick, also took to the podium to welcome the guests. “These kinds of initiatives and helping hands allow us to enhance our strategies and allow for our continual development in challenging our learners to make a success of their lives. We thank you for the growing interest in our school as a whole and your incredible friendship. In South Africa we embrace the spirit of UBUNTU and today we extend that courtesy to you,” Brodrick said as she closed the opening. TNPA contributed R40 000 towards refurbishing our Foundation School Facilities. The parastatal brought a team of 50 and they were split into four different groups to carry out their different projects. 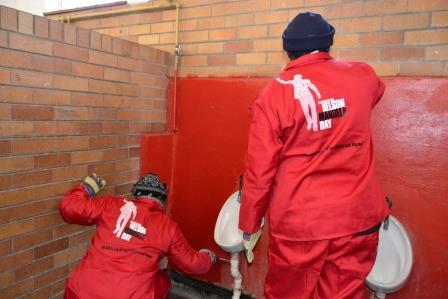 The teams spent the day painting toilets, installing new taps and a ceiling at the Foundation Schools’ hall. Meanwhile Hollard and Virgin Active were hard at work cleaning up at the Combined School. Both teams were happy to get their hands dirty as they cleaned up the skip waste area as well as the compost and gardening area. 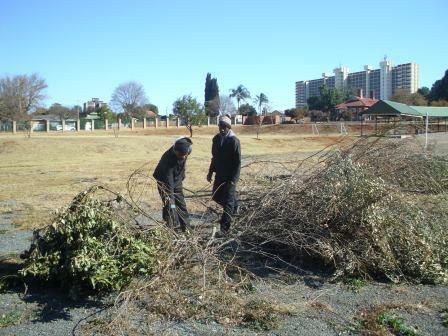 Their commitment to the Madiba spirit was evident as they strived to meet the needs of the organization in keeping the grounds beautiful and litter free. All three companies did a stellar job with a wonderful attitude of wanting to give back and General Manager, Jackie Gallagher, had nothing but good things to say. “Thank you for giving of yourselves in such a wonderful way today. I really hope that you can find the time to come back and see the impact that that you have made in our children’s lives,” Gallagher said. 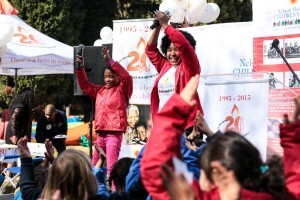 On 10 July 2015, the Nelson Mandela Children’s Fund (NMCF) hosted their annual Children’s Celebration at their foundation in Johannesburg. The celebration commemorated the great statesman’s life and legacy by celebrating the very beings he devoted his life to protecting. 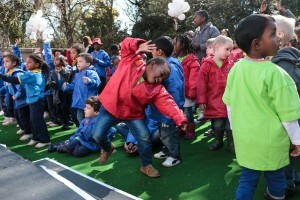 The theme was “there is a hero in every child”, with the aim of recognising every Childs ‘uniqueness and talent. 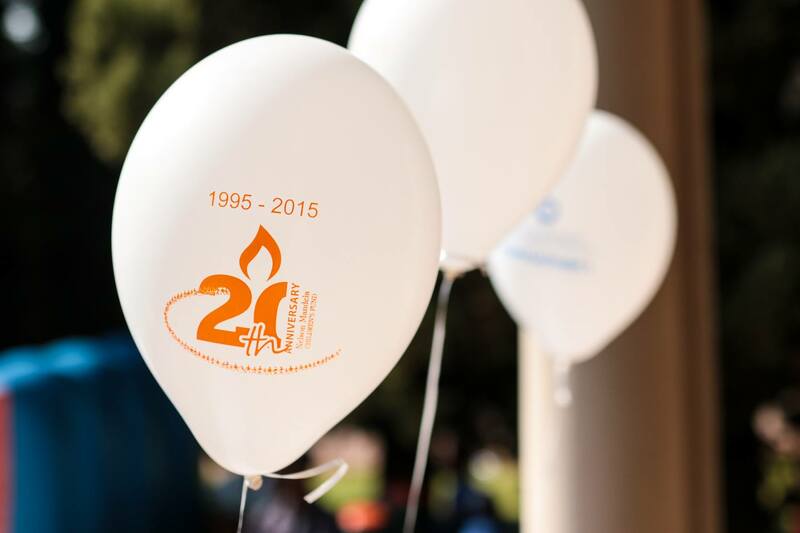 The event brought children from different primary schools across Gauteng together to celebrate the funds’ 20 years anniversary. Founded in 1995, the NMFC is the brainchild of the late Dr Nelson Mandela which was inspired by his love for children and his desire to end their suffering. The ceremony kicked off with breakfast at 9:00am and it was all fun and games thereafter. The children had the opportunity to enjoy themselves indulging in various activities. The young heroes were awarded the platform to showcase their skills through song and dance. 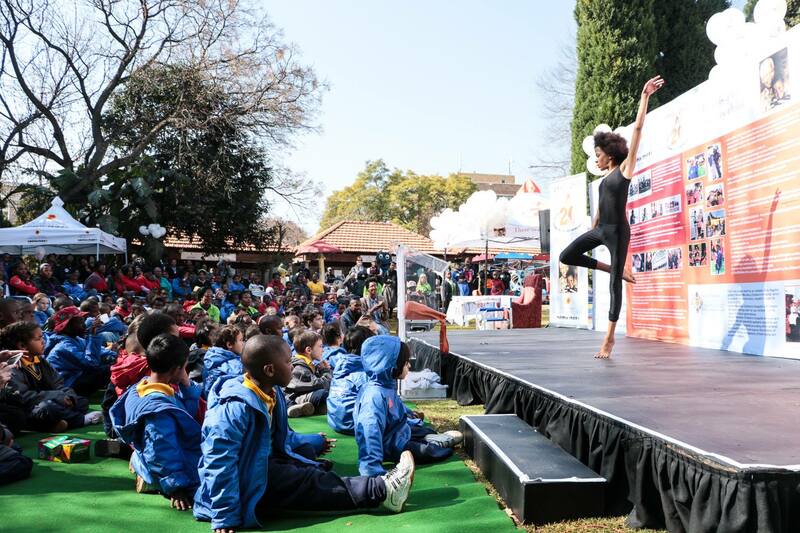 Former Sparrow Foundation School learner, Ashley Magutshwa, was among the performers of the day and gave a stellar ballet performance, much to the audience’s delight. The day was also an opportunity for various non-governmental organisations including Sparrow Schools to carry out exhibitions for their different causes. 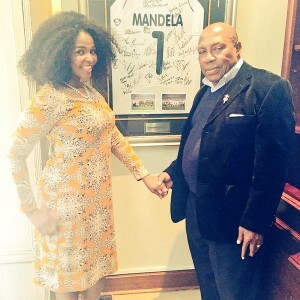 Among the public figures in attendance were musicians Simphiwe Dana, Kabomo, Muzarts’Rorisang Thandekiso and Bafana Bafana Coach Shakes Mashaba. After show time, everybody was invited to lunch before indulging in two large birthday cakes enough to feed the nation. The ceremony concluded at 2:00pm and all thanks goes to all the sponsors including Pick’n Pay, Oral B, and emergency medical service ER24, who made it all possible. Follow us on Twitter and like us on Facebook and help us inspire action and change lives. 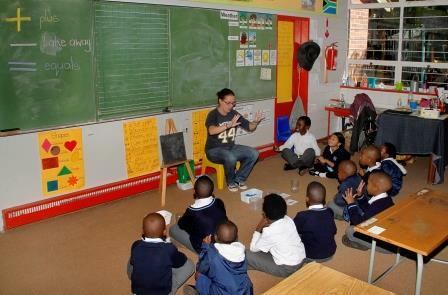 Spend your 67 minutes for Madiba with Sparrow Schools and you can help inspire action and change lives. Be the change that you want to see and choose a project to adopt. 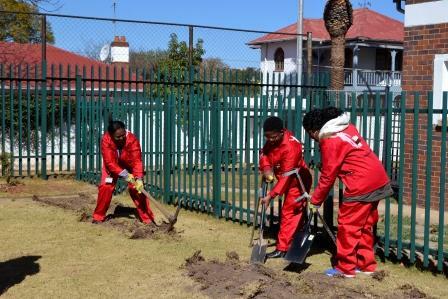 Help improve facilities with a coat of paint or better yet, convert your minutes to Madibas. See projects you or your organisation can adopt below. “Creating a better world requires teamwork, partnerships, and collaboration, as we need an entire army of companies to work together to build a better world within the next few decades. This means corporations must embrace the benefits of cooperating with one another,” Simon Mainwaring. Through partnership with industry, Sparrow FET College continues to make great strides in ensuring that its vision and mission of equipping youth with skills is realised. The FET College strives to build strong partnerships with members and representatives from various industries. Through these partnerships, the College is able to offer bursary programs and learnership opportunities to students who would normally not be able to further their education. 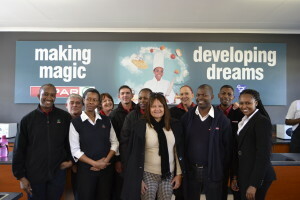 On 24 June 2015, The FET College hosted Store Supervisors and managers from various Spar outlets across the country for a Professional Cookery program overview. 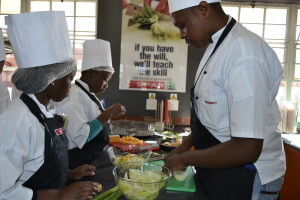 The program is designed to provide SPAR with a recruitment pool of suitably trained youth; the program trains the student towards the completion of the Professional Cookery @ NQF level 4. The day kicked off with the visitors being served welcome drinks and canapés by the students. Job Coach, Mary Webber, then proceeded to the nitty gritty’s of the whole purpose of the session, going through logbooks, clarifying roles of both the supervisors, managers and the students. From there, the visitors got an opportunity to meet and interact with the Professional Cookery students. 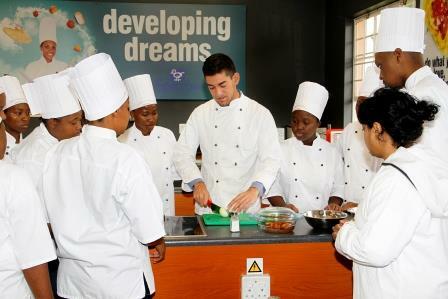 The students also got the opportunity to showcase their skills and treated the visitors to lunch prepared by them. 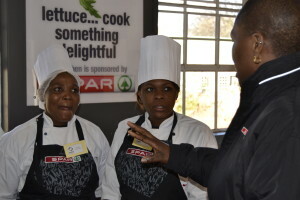 The relationship between the College and Spar continues to enjoy much success with the Assistance Chef program achieving a 69% employment rate. The success of the College’s vision and mission to provide young South Africans with a livelihood relies on these sorts of partnerships. These kinds of collaborative initiatives provide an opportunity to improve the lives of dis-empowered young South Africans. They contribute to the larger objective of uplifting the country’s economy and the well-being of those marginalized in our society. Creative Writing student Jets off to Germany! Sparrow Schools sends a round of applause to our very own creative writing pupil at the Combined School, Shivar Lalla. Lalla overcame the odds and was awarded a scholarship by the Goethe-Institute. 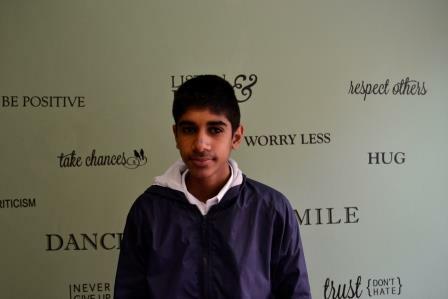 He is representing Sparrow Combined School and is joining other pupils across South Africa for a three-week German language course in Munich. The course kicked off from 14 June 2015 and will conclude on 4 July 2015. 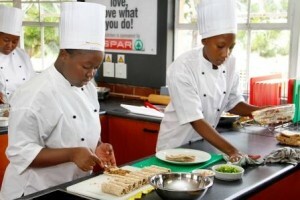 Sparrow Schools is extremely proud and wish Lalla all the best. He is not only representing the School but the whole of South Africa. Life Skills Facilitator, mentor, counselor, and pastoral care are just a few titles Mr Thami Thomo goes by. One would think the family man has his hands full with two of his own children, two adopted teens and now a father figure for many kids at the Sparrow Foundation School. However, Thomo is not fazed by it all, he takes fatherhood seriously, drawing inspiration from his own journey; being raised by a single mother after losing his father at the tender age of six. Thomo is part of the multifaceted Learner Support Unit team responsible for psychological wellness of the learners at the remedial school. 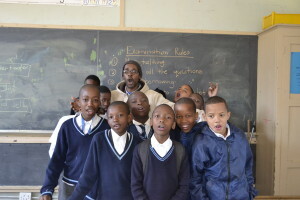 His involvement in the Pastoral Care unit includes constant nurturing, self-esteem rebuilding, encouraging parental involvement for those learners with parents and often mentoring the boy child without a biological father figure. “When mentoring; positive punishment and exclusion of intimidation is vital. The emphasis is on love and instilling a structure for the boy child”, Thomo explains. He has been confronted by a number of learner cases where hurt, anger and sometimes brokenness is evident. Many of the learners have been stigmatized for attending a remedial school, some have lost their parents or even abandoned. “It is my duty to restore their self-esteem and teach them life skills using biblical references,” Thomo says. Considering the amount of time children spend in the school environment an attempt to model a father figure is a fair chance at reversing the negative effects of our fatherless society. Such interventions are aimed at enabling the ability to understand one’s self and coping with the challenges life brings. This proactively eliminates the number of children with a negative image of men. 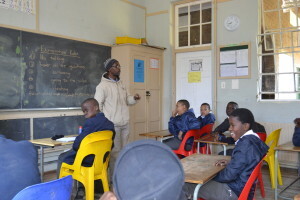 “It has to start somewhere and my start is You are Loved, You Belong and You are Precious,” Thomo says with a smile reciting the motto he has instilled in his learners. 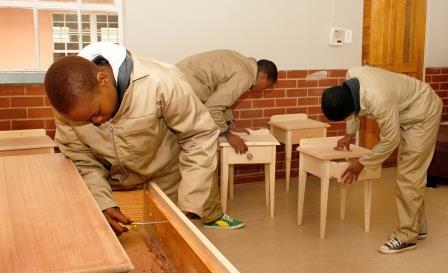 South Africa continues to be plagued by skills shortages partly due to our country’s inability to develop, utilize and retain enough human capital. The lack of investment in skills development has been identified as one of the critical restrictions to economic growth and employment creation by government. The scourge of skills shortages contributes to building social ills, leaving our country with high unemployment levels. Although South Africa is considered by many to be the Economic hub of Africa, a lack of skills shortages presents our country as one of the most unequal societies in the world. 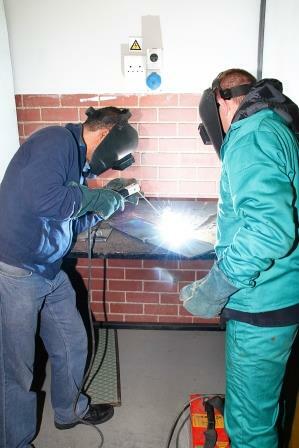 Sparrow FET College together with its various industry partners continues to champion the fight against this lack of skills shortages. 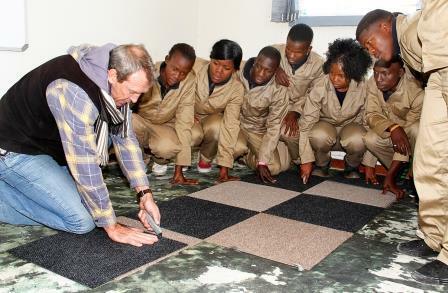 In 2014, the FET College continued in its pursuit to partner with different industry players including Spar, Pirtek, Belgotex, Imperial and many others to provide youth with critical and scarce skills. Through the past year, these partnerships have proved to be efficient in producing qualified artisans. Many of our graduates are now fulltime employees and some have been absorbed by our partners. The most notable successes were from the Automotive Repair & Maintenance, Assistant Chef and Power Fluid Hose Assembly programs. The aforementioned programs achieved employment successes of 81%, 69% and 68% respectively. Across all programs, we can prove that 60% of our graduates gain full-time employment. Credit must be given to the Sparrow Trust employees who played major role in ensuring these successes. 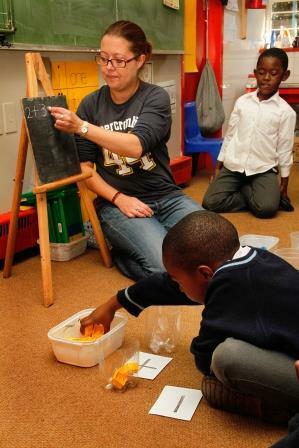 This particularly includes the qualified FET facilitators who bring with them a wealth of experience. Most students who enrol into the FET come from disadvantaged backgrounds and bring with them a sense of disillusionment and find it hard to believe that they can succeed in life. This is where the quality of our facilitators comes into play. Because of the facilitators, a lot of the students gradually realise that there is still a fighting chance. “The trick is to not only focus on the study material because I have also taught these students the value that is respect. If you give them respect, this contributes to their self-esteem and self-worth. 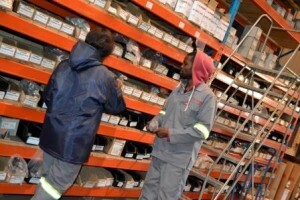 I try and put them in the employer’s shoes and ask themselves this question, ‘which employee do you think you would employ amongst yourselves?’ says Power Fluid Hose Assembly facilitator, Parker Shamiel. It is only through skills development that we are able to continue to successfully produce self-reliant young people. This helps provide South Africa’s economy with a competitive advantage over the rest of the world.